be with us ever after. This Irish blessing plaque features a kitchen prayer with a dimensional design that may hang on the wall or stand with the attached easel backer. The Irish kitchen prayer includes great detail from the green enamel shamrocks to the food and utensils on the table. 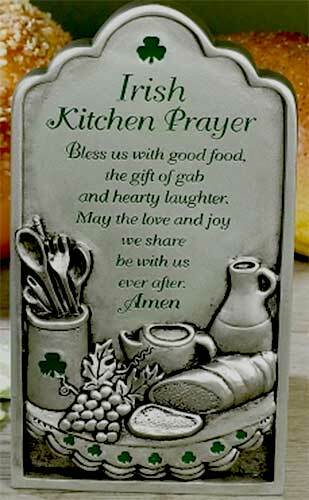 This Irish kitchen blessing plaque is made of a composite material with look and feel of pewter and measures 3 3/4" wide x 7" tall. This Irish blessing plaque is gift boxed with a shamrock history card, complements of The Irish Gift House.